When I was growing up, I never much appreciated writing. Maybe it was because I wasn’t good it at. Maybe it was because children in general never enjoy writing, let alone have a writing process. I remember sitting down and staring at a blank white paper. Those red and blue faint writing lines staring back at me. I would feel paralyzed. In elementary school, everything was handwritten. Despite that fact that it was difficult enough to come up with something to say, you had to write it in pencil. This meant lots of broken points and plenty of schmeared eraser marks. All this to generate poorly constructed sentences. The problem with pencils is that it becomes such a burden to revise. Because its so difficult you leave what you have. What gets written the first time stays. As I got into Junior High, I remember getting our first computer. This meant it was time to start typing my reports or homework assignments. 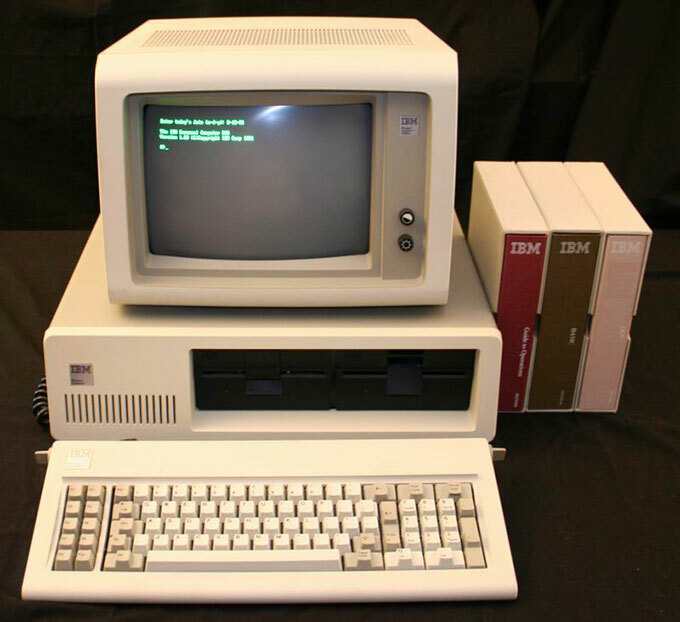 I remember the big daddy IBM computer with monochrome screen that I would type on. This bad boy was state of the art. I remember the keys being deep and spring loaded. 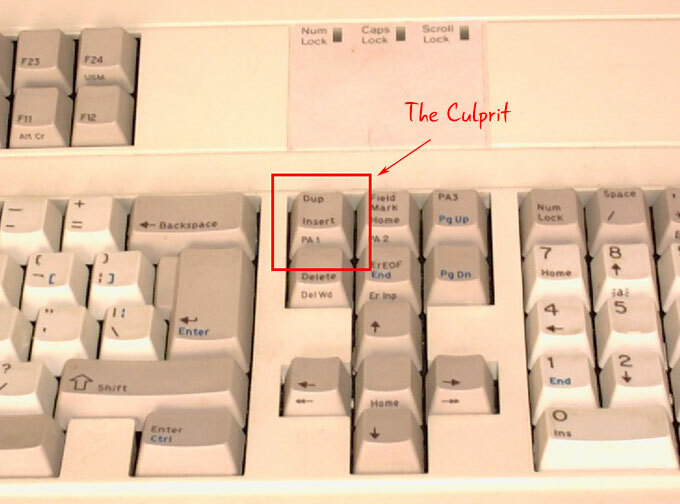 You would press a number and it would make an amazing clicking noise and spring back up. It was almost fun just to press the buttons. It was far from streamlined and felt typewriterish. I remember spending hours writing a story about people moving west in their wagons. I think we had to write 1000 words about the terrible trip people made while moving west. At the time it took hours. I didn’t have a wrianting process. In hindsight I’m not sure why it took so long to write. I think I built it up to be something it wasn’t. Its kind of like Space Mountain. You had remembered it being amazing and pitch black and thrilling. As an adult and it’s rather lame. You can see the track as you coast through a musty building in Orlando. 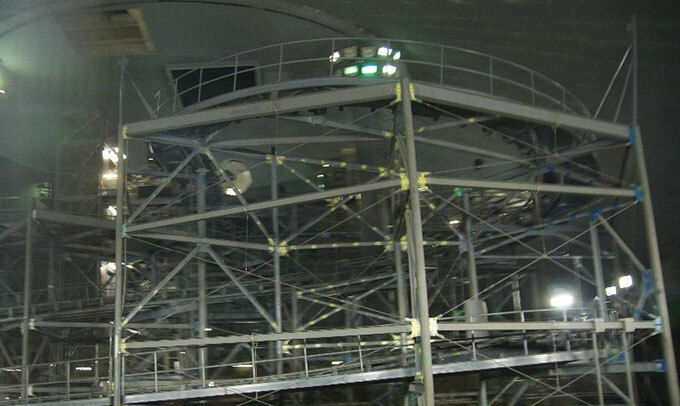 Space Mountain with the lights on. A little disappointing huh? Anyhow it was late and I had spent many hours typing up this elaborate story. I was just about done and started to go through the document. My writing process at the time consisted of correcting spelling mistakes. Spelling was the only thing I revised when writing. There wasn’t much attention to improving sentence structure or anything of that nature. As I went through the second paragraph, I noticed something happening. As I clicked on the keys, the letters were replacing the existing ones. I would type a letter and it would cover up the letter in front of it. It wasn’t inserting and rather replacing by text. Every time I tried to fix it, it just kept covering it up and getting worse. I called my mom over frantically. “Mom, I don’t know what is happening but everytime I press a letter it eats one on the screen.” She sat down calmly as she always did. “Relax, let’s take a look,” she said. The same thing happened for her. At this point I was hysterical. I had spent hours writing this terrible story. I was going to have to retype the entire thing over to fix the problem. All I wanted to do was get rid of the spelling mistakes. If you haven’t realized by now, the “Insert” button had somehow been pressed. At the time we had no idea this button even existed let alone what it did. My mom ended up retyping the entire document. A couple months later, someone taught us about this mystical button. I still think about this to this day. This was a time when most people didn’t have computers. You couldn’t “Google” something. There was no Google let alone any internet. My dad had just purchased a modem that had a 2400 baud rate that was top of the line. I remember it being $1000 and it allowed him to connect to his work computer from home. I’m not sure what he needed it for but it seemed cool at the time. Between my daunting writing process and fabricating a story, writing was never my thing. I struggled with grammar in high school. I had tutors to try and teach me what a Subordinate Conjunction was. I still have no idea. It sounds like an unruly train station to me. As I made my way through high school, the paper lengths got longer and longer. Still I had no formal writing process. Write 5000 words on photosynthesis was a paper I remember. I became efficient at checking the word count. I would write a couple sentences and check the word count. Write a couple more and check the word count. This was my writing process. Suffice it to say that I graduated a poor writer. It wasn’t my thing. I was a math and science guy. As I made my way through college though, I finally started to improve my skills. I started to appreciate the writing process a little more. I think the embarrassment from professor remarks and comments helped improve my writing. It still felt like a chore though. About this time, I realized the importance of writing. I realized I needed a writing process. Writing was the most important skill that anyone can have. Writing combined with speaking. They both are crucial for communication. Communication is what makes someone more efficient than another. It’s what makes you able to get ahead. If you can’t communicate, you are useless. It’s like a baby when they are first born. I remember my older daughter getting frustrated with us. She was upset that we weren’t understanding what she wanted. At about 1 she was grunting and had a limited vocabulary. Regardless, she wanted to communicate. She would grunt commands that my wife and I would try and decipher like it was a game show. Communicating in work is mostly done through writing. You are writing emails. At least in my line of work most communication is written. Whether, texting, chatting, emailing or hashtagging, it involves writing. I started to concentrate on making sure that my emails were perfect. This was the first step in formalizing a writing process. I made it a point to write an email and then read it a second time. On the second pass I was correcting grammar and spelling. More importantly I was looking for areas of confusion. Where could someone misunderstand me. If it wasn’t clear, I would further clarify. I continued to work on this over the years. I improved my writing process. While still not a great writer, I feel like I have improved my communication. I measure my words carefully(most of the time). When you put something in writing it’s there for good. It can be taken out of context and used against you. As part of my writing process I’m also careful what I write. I make sure never to write something that I don’t want someone else to read. Emails once sent, are out of your control. I can’t tell you how many emails were forwarded without me realizing it. I would cringe thinking why he or she forwarded it. If you don’t want it forwarded, think twice about writing it. As I started working with real estate, I had to adjust my writing process. Real estate is a funny business. Often times you have to stretch a sentence and embellish your descriptions. You have to take a sentence like “This is a small, old house.” and elaborate. The quaint charming house sits nestled in among a private tree lined street. Original charm exudes history from this quintessential pied-a-terre. Adjusting my writing process helped me improve my BS skills while measuring my words. I believe in the mantra of less is more when writing business communication. I always tell my people to leave out the love story. As I started to write for our websites though, I needed to flesh things out. I needed to write more content. Google loves content and loves rambling. The more you give them, the more they value your page. This was a change and I had to revise my writing process yet again. So I wrote lots of blog posts for our sites. They weren’t personal posts or anything like we are doing here at Long Live The Interenet. They were boring posts about the Texas Sales Contract or about Condominium By Laws. 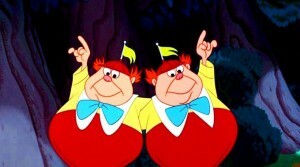 They were blog posts with keywords related to our businesses so that we could be found. The blogging was working and we increased traffic to our sites. We started converting traffic coming from these blog posts, so I kept writing. As I wrote more and more, it became easier and easier to just write. My writing process was evolving. I stopped thinking about the task of writing. Thinking about it becomes daunting. Sitting down and just doing it, makes it a lot easier. At the same time I started reading about people making money online. They were writing ebooks and either selling them through their sites or on Amazon. They were making real money. It wasn’t just play money and they were quietly bringing in thousands a month. I woke up one night last year and decided I was going to write my first eBook. It wasn’t a masterpiece by any means and its a stretch to call it a book. Its more of a How To guide. 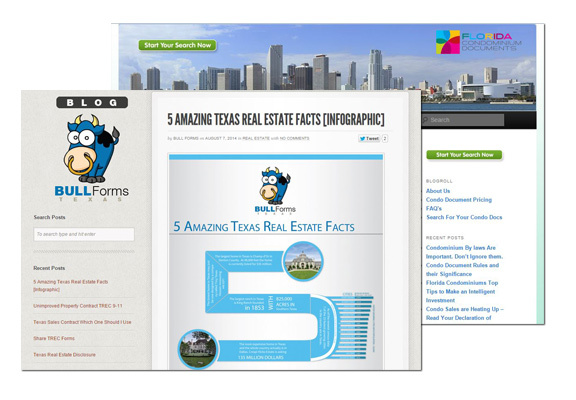 It walks agents through filling out a form that they use in their business. Its only 10k words but I was psyched I was able to do it. We still sell this book today on our site. You can read the full story about writing an eBook in 24 hours here. It felt rewarding to sit down and actually bang it out. My writing process from this experience changed further. I realized the importance of outlines when writing longer pieces. I wouldn’t think of approaching a book without one now. A couple of months ago, we just completed what I consider to be our first real book. 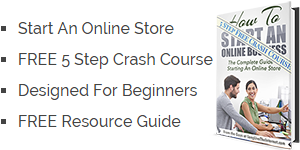 This book walks you through all the steps to creating an online store. This was months in the making and I’m proud of this book. If you join our email list here, we will send you some free excepts and lessons from the book. I think the reason I’m proud of this book, isn’t because the writing is so great. It’s not, and this is something I continue to work on. My writing process improved while writing the book. I think though what I’m proud of is the content. It’s full of incredible tips and lessons that we have learned over the years. It walks you through the steps of starting an online store. Its something I wish I had when I started with online businesses. As I started working on Long Live The Internet, I started writing more. I wanted to focus on improving my writing process further. I came across a blog post about another blogger and his writing procss. He was explaining that it only took him a couple of hours to write his post. He then went into detail about his particular writing process. He said he would write the post, first time through, without stopping. He would then read through to make sure it made a sense and correct any blatant mistakes. He then would Hemingway it. Lastly he would go through and put the images and links in the post. Wait.. What? He would Hemingway it. What the F&$# is Hemingway and when did he become a verb. Lucky for me there was a link. 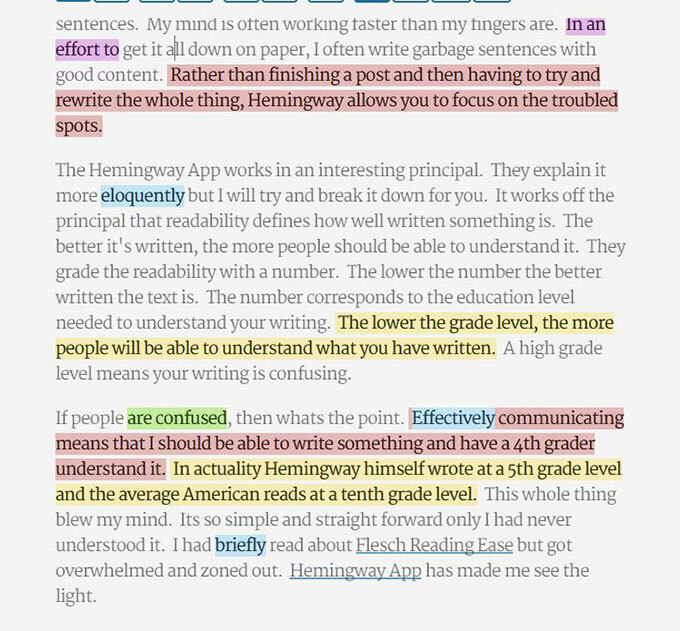 Behold the magical Hemingway App. I love this tool and can’t thank that man enough. This is the most recent step in my writing process. Dump your terribly written article, blog, or paper onto the site. Once you place the text, it highlights the problem with your text in real time. Sentences that are difficult to read are marked in yellow. Sentences that are very difficult to read are marked in red. It shows you simplified alternative phrases for complex words. In short, its amazing. I knew that a lot of my writing was bad. I knew that I wrote with lots of run on sentences. My mind is often working faster than my fingers are. To get it all down on paper, I often write garbage sentences with good content. I no longer have to read through the details of every sentence a second time. Hemingway allows you to focus on the troubled spots. The Hemingway App works on an interesting principal. They explain it more eloquently but I will try and break it down for you. The principal is that readability defines how well written something is. The better it’s written, the more people can understand it. They grade the readability with a number. The lower the number the better written the text is. The number corresponds to the education level needed to understand your writing. The lower the grade level, the more people can understand what you have written. A higher grade level means your writing is confusing. If people are confused, then whats the point. Effectively communicating means that everyone should be able to understand. Hemingway wrote at a 5th grade level and the average American reads at a 10th grade level. You should shoot to have your writing score at a 4th grade level. This whole thing blew my mind. It’s so simple and straight forward. I had no idea. I had briefly read about Flesch Reading Ease but got overwhelmed and bored. Hemingway App has shown me the light. After using Hemingway for some time now, I can appreciate how poor my writing actually is. I have too many run-on sentences and lots of incoherent thoughts. I am making a conscious effort to write with shorter sentences. I’m trying to put one thought into each sentence. This prevents stringing together many different thoughts. It’s helping and I seem to be getting a lower grade on my first initial check on Hemingway now. But I am hooked and think these guys have built something amazing. Its simplicity in a topic that is anything but. Writing is difficult and this step is now instrumental in my writing process. So when you have some time, head over to the Hemingway App. If you are blogging for your ecommerce site or writing an eBook, I can’t recommend it enough. Regardless of your writing experience, this deserves a spot in everyones writing process. Its helping me and it certainly can help you.